$1095 per person land-only from La Paz. The flat, high Andean plain creates a laminar air flow over the basin. The lake absorbs solar radiation and acts as a heat sinc to improve seeing. 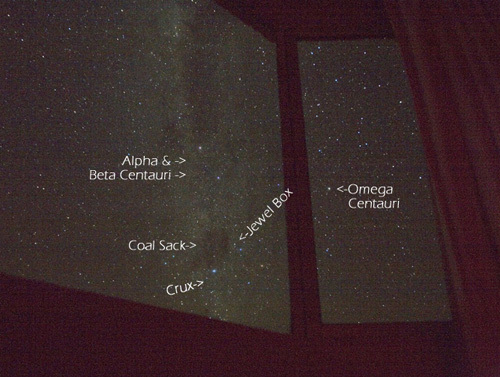 At 16° South, we have the richly colored Milky Way overhead at Zenith. This makes for exceptional views of planets if so desired. Smaller telescopes can gather more light and resolve smaller objects due to thinner, more transparent atmosphere. This thinner atmosphere with less scattering also allows for observing and imaging in what would be less favorable circumstances elsewhere. Moonlight of the crescent moon does not scatter as much in this atmosphere. Seeing is also much clearer and contrasted in low altitudes near the horizon. This allows observers to image longer and lower than elsewhere. 15 second exposure through our hotel room window. Some observers image, others observe with instruments on-site. Others bring their own or use binoculars. Binoculars are a very good idea your first trip down to familiarize yourself with a sky 'turning the wrong way', twice as bright , filled with different constellations, with known constellations turned sideways, and filled with more stars. 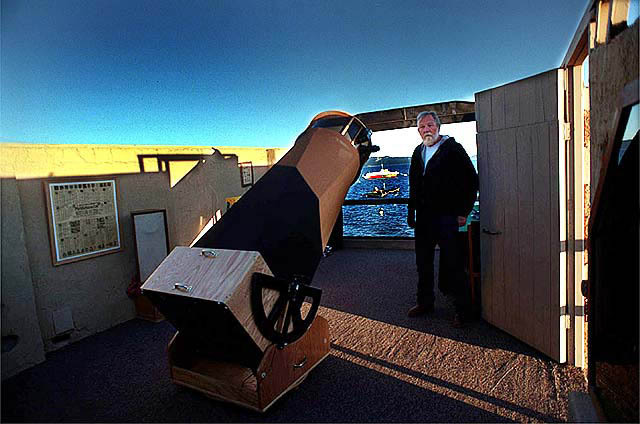 On-site instruments available for public use are: 22" Starmaster Dobsonian, 10" Starmaster Dobsonian, 10" Meade LX 200. The 22" Starmaster has been fitted with Argo Navis Goto tracking. However, most observers just push it around. It sits in the Alapacha roll-off roof observatory. It has a Paracor Coma corrector and Naegler 22mm and 9mm 2" eyepieces. Remember that at this altitude, the brightness of objects is much higher and images are quite a bit clearer. This scope is best for looking for really dim, over the top 'pillars in the eagle nebula' kind of deep sky objects. Omega Centauri fits in the eyepiece but only barely. Eta Carina is too large to view in one eyepiece with the 20" Starmaster and 20mm eyepiece. Observers typically spend several minutes (not moments) moving the eyepiece around to view the whole nebulae. With high power, the lobes on the central star can be detected.